Whether you choose a colorful tile mosaic, marble subway tile, a modern glass panel, or something else entirely, the backsplash can be one of the most striking and beautiful elements of your kitchen design. Because the kitchen is such a function-forward space, however, you don't always have the option to create a seamless design. The backsplash often has to flow around obstacles like sinks, stoves, cabinets and microwaves, but the most common interruption is of course: outlets. 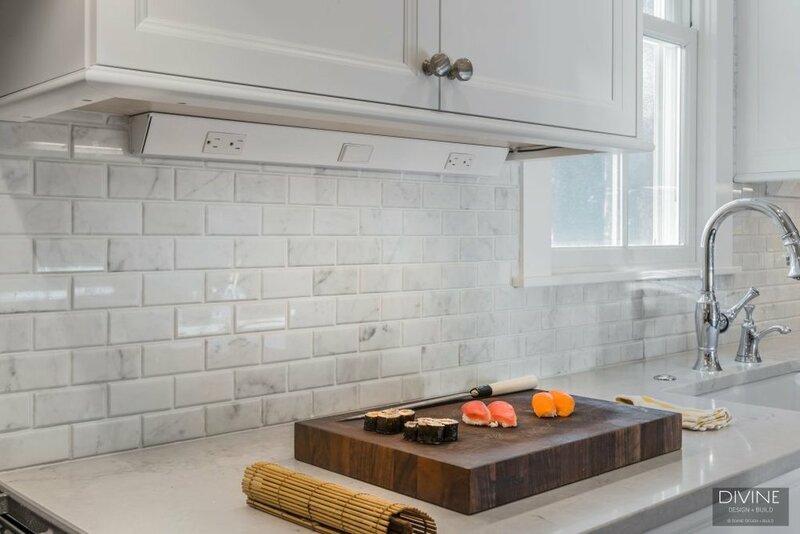 If you're looking for alternatives to having a half-dozen outlets in your walls that detract from the beauty of your design, here are a few ways to create a kitchen backsplash without outlets (or at least one with fewer outlets). Install outlets underneath the cabinetry. This is creative way to remove the appearance of outlets in your kitchen altogether. From eye level, you can hardly see the strip of outlets that is hardwired to the underside of the cabinetry here. There's also a switch for an under cabinet light on the panel. Install pop-up outlets in the countertops or cabinets. If you're worried that positioning your outlets underneath the cabinets will make them hard to access, or you don't have any upper cabinets above your backsplash, consider putting outlets in the countertops instead. Our preferred method is to install pop-up outlets that retract into the counters for a streamlined look, while at the same time staying safely tucked away from water/food/utensils. Read more about kitchen outlets here.